I first published Cling Film Art on our former site ‘Craft Ideas for Kids’ in 2014 and it’s inspired a huge stream of mess-free processes that can widely found across Pinterest. 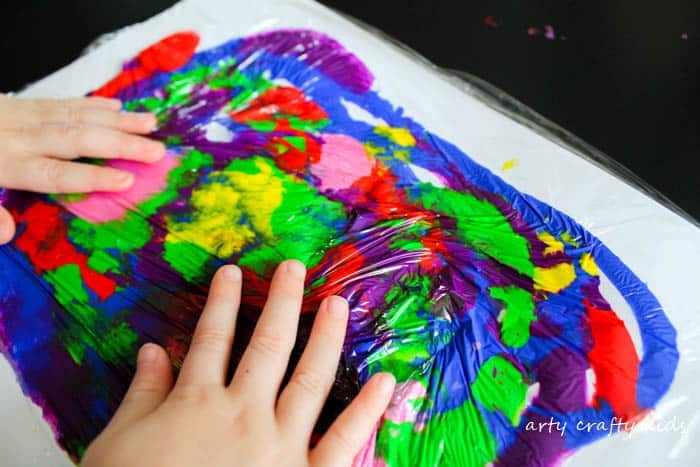 We’ve used this process time and time again from creating obscure abstract art, to introducing babies to painting without the mess, to a little bit of fun on a rainy afternoon and creating awesome backdrops for sunsets and under the sea fish art. 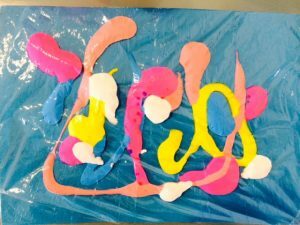 We’ve swapped the cling film for zip locked bags and bubble wrap for some extra sensory fun, and I’ve seen readers caught up in mess free vs messy disputes. 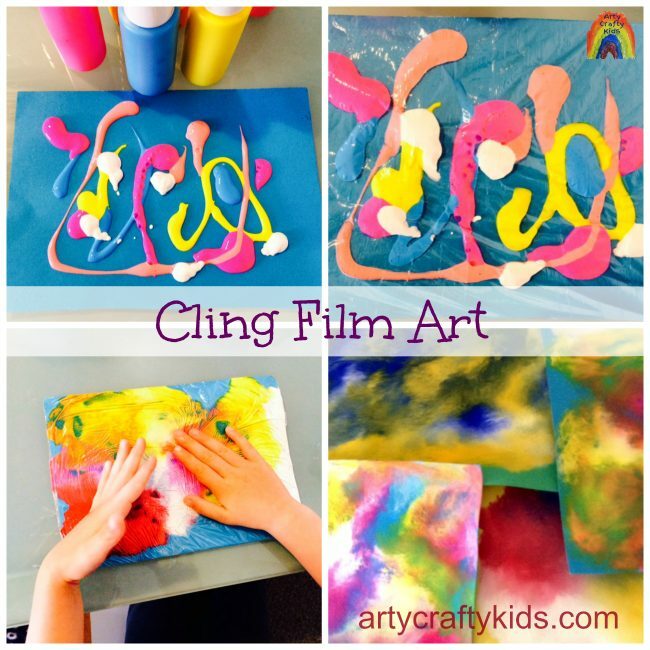 Cling film art is not about the merits mess vs mess-free processes, it’s simply another fun art idea that creates awesome colour blends and abstract unique pieces. 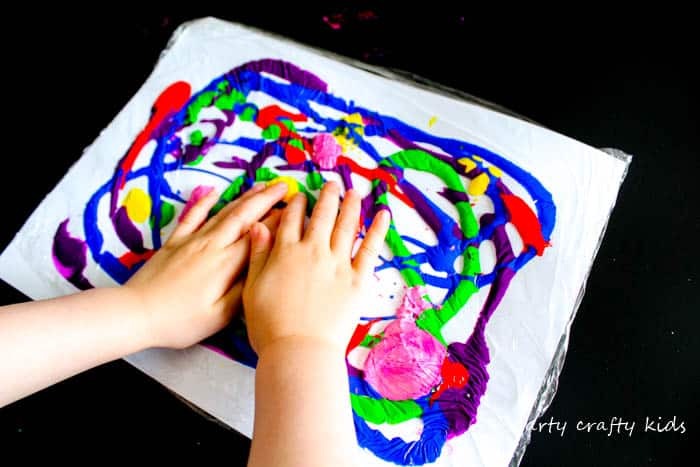 And for children who dislike getting their hands messy, it is also an ideal process that accommodates their sensory needs (as i’m sure we can all appreciate that not all kids enjoy mess). 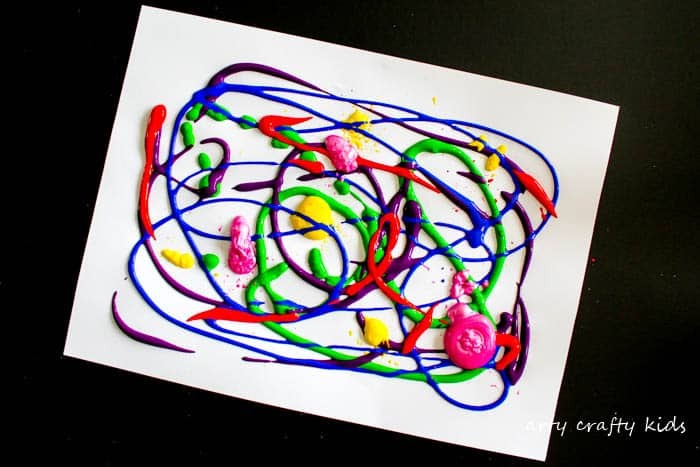 This process works best when the paint is spread across the card as shown above. 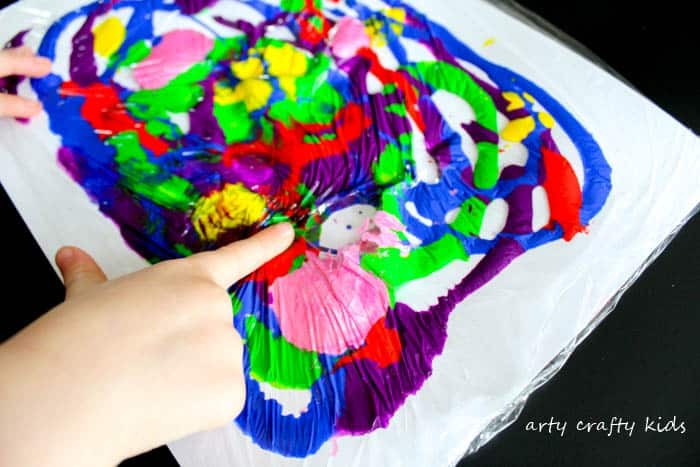 I’ve seen many bloggers attempt this with large splodges of paint, but in my experience this makes the paint difficult for little hands for spread and it doesn’t spread and mix the colours particularly well. So pick up the bottle, give it a gentle squeeze and allow it to flow freely; spreading the paint randomly across the card, criss-crossing with other colours. Next, cover it in cling film. Be careful not to wrap the card too tightly. 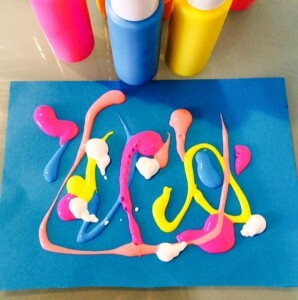 There needs to be a little give in the cling film otherwise the paint may become difficult to spread. And now for the fun bit. Place two hands onto the cling film and begin spreading. 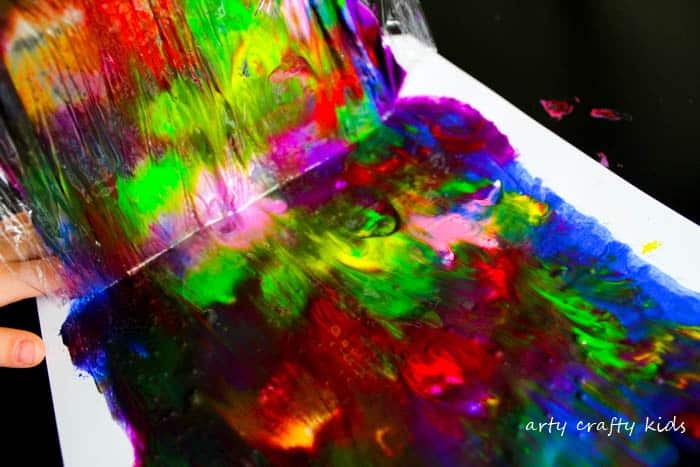 Gently mix the colours and see what happens. Spread it quickly, gently, with one finger or bash it (as my youngest daughter attempted). 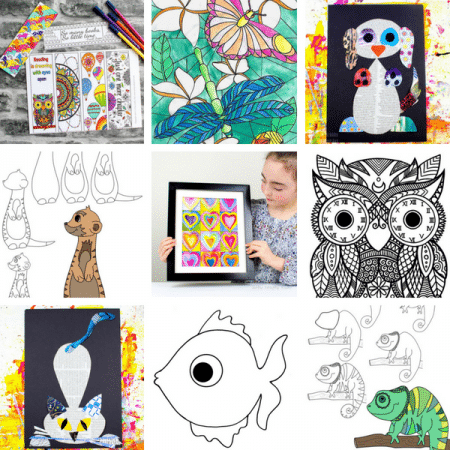 What new colours and shades can your little ones make? And once the paint has been spread across the card, peel the cling film away to reveal the finished piece. 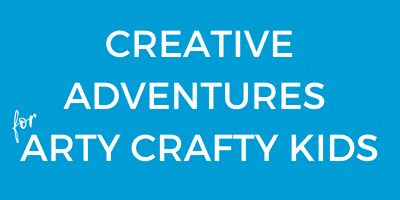 I adore this process and my children have loved it over the years. 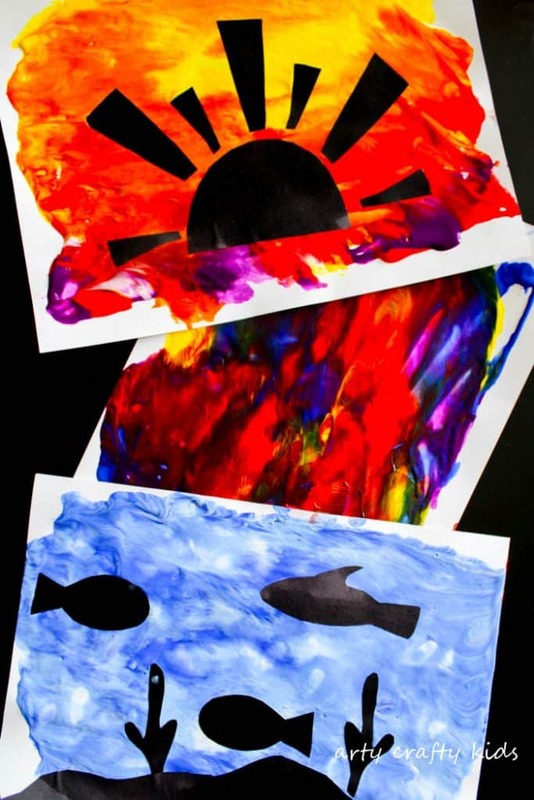 The colour blends are amazing and great for cosmic, under the sea and sunset scenes. 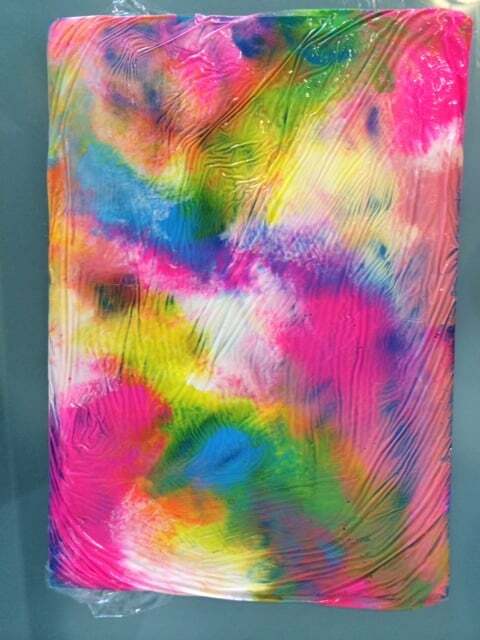 But most of all, it’s all about the process and there really is no right or wrong to cling film art. 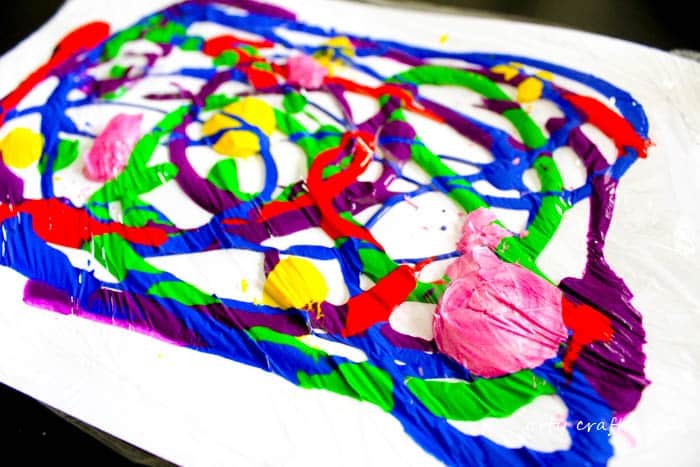 For more process fun process art ideas, check out our bubble wrap prints, yarn art and craft stick canvas! 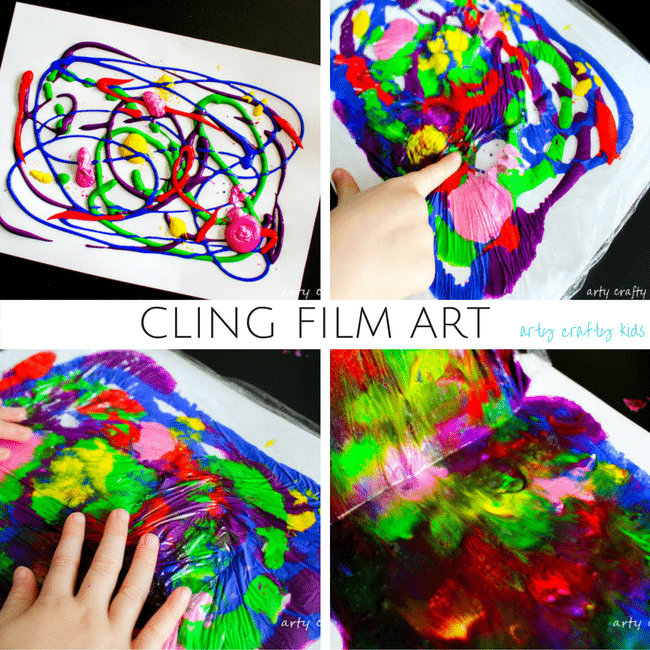 Cling Film Art is a fabulous art process for little kids and great one for parents too, as it is virtually mess free! 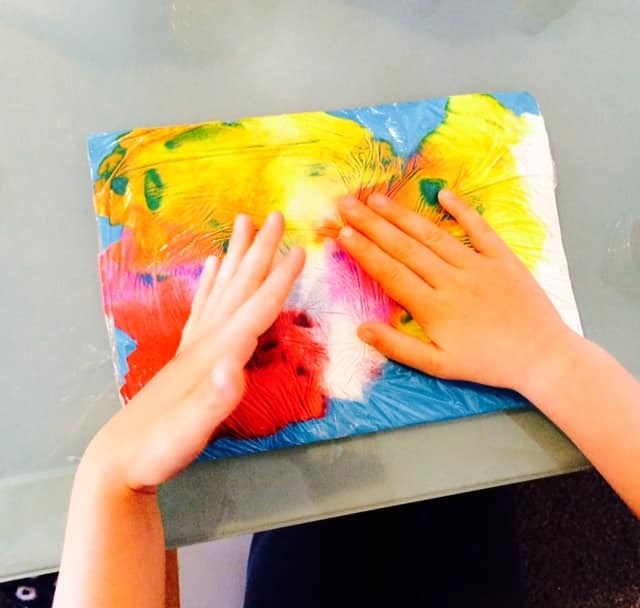 Crafty kids adore spreading out the lumps and bumps, merging the colours to make pretty patterns ; providing a sensory element to the art process. It’s an art process we’ve revisited time and time again, and one we’ll continue to use for many of our projects.